I'm soooo glad that I decided to check your blog before going to bed! Thank you! I just picked up a pair of Hold-On Tights, 2 pairs of Pushing Limit Tights and a few bras. I already have a pair of the Hold-On Tights with the side lace panels and I loved it. Been eyeing for the solid pairs and now $69 is a great deal! This is crazy! Some of this stuff seems like only a few weeks old. I hope more items are uploaded tomorrow... I was so excited for lulus black Friday sale and when I looked through their we made too much section this morning I only saw one or two things I would think about buying, and I probably won't even buy those. Hi! Does anyone know if in store today they will honour the on-line prices? As I went to check out with both the Extra Mile LS and High Times, at the last step my items were sold out!!! I took screen shots of both and I am willing to go in to show them! Thanks! They will not but it’s likely if it’s a Black Friday item it’ll be the same price. 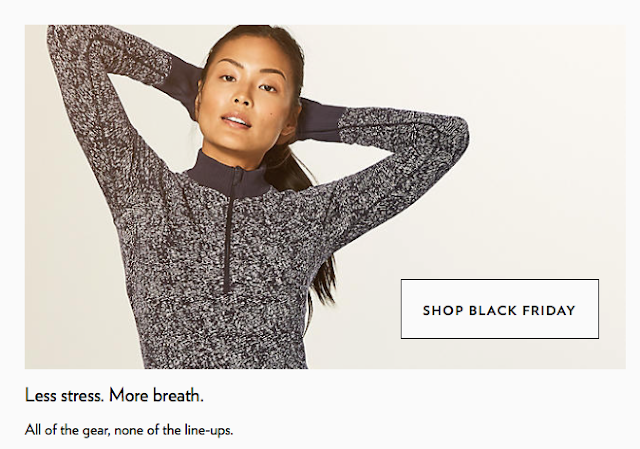 Does Athleta do black Friday sales? They won't honor online WMTM prices in store, in my experience. They won't honor MDs from store to store either. But it never hurts to ask! Fingers crossed, you'll find what you are looking for on sale anyway! I keep going back and refreshing hoping for some better items. I feel there is not much there of value. Just meh items. kind of lame "sale". Much of what was already in WMTM! Hope Cyber Monday is better. Athleta had 20% off everything in store and also online today. In the past, Lululemon has never done "Black Friday" in the true sense of how other stores do it. They had a special edition clothing upload, dropped a few more things onto WMTM and that was that. This year really is no different. They had a few new SE items but they weren't as heavily promoted as in the past and they dropped some stuff onto WMTM. Same thing as always. Their big WMTM sale/drop is for Boxing Day. Always has been. Extremely disappointed by Lulu's so-called Black Friday. No holiday capsule and almost nothing new added to WMTM. I really thought they were turning things around, but this is just ... odd. Do they seriously not care about staying in business? Who acts like this? For the holiday season, we thought we'd add... 1 pair of pants and 1 plain sweater. Woo-hoo! I went to my local lulu and everything was $10 cheaper than WMTM. I got a pair of pushing limit pants, mind over miles pant, train times crop, enlighten bra ($24!!! ), free spirit short, and train times bra all for under $250 dollars. I thought the deals were great! Hi Jillian. Which store did you go to? Might as well buy there than online if it's $10 cheaper. You scored with your haul!